"Early Science with the Large Millimeter Telescope: Detection of Dust E" by Alexandra Pope, Alfredo Montaña et al. We directly detect dust emission in an optically detected, multiply imaged galaxy lensed by the Frontier Fields cluster MACSJ0717.5+3745. 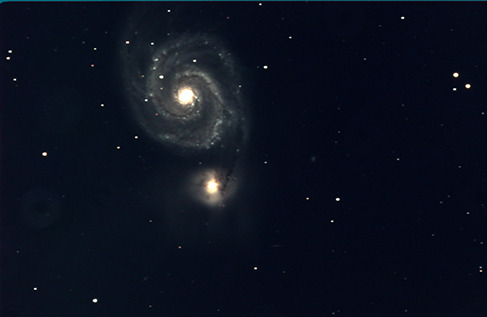 We detect two images of the same galaxy at 1.1 mm with the AzTEC camera on the Large Millimeter Telescope leaving no ambiguity in the counterpart identification. This galaxy, MACS0717_Az9, is at z > 4 and the strong lensing model (μ=7.5) allows us to calculate an intrinsic IR luminosity of 9.7 × 1010 Le and an obscured star formation rate of 14.6 ± 4.5 Me yr−1. The unobscured star formation rate from the UV is only 4.1 ± 0.3 Me yr−1, which means the total star formation rate (18.7 ± 4.5 Me yr−1) is dominated (75%–80%) by the obscured component. With an intrinsic stellar mass of only 6.9 × 109 Me, MACS0717_Az9 is one of only a handful of z > 4 galaxies at these lower masses that is detected in dust emission. This galaxy lies close to the estimated star formation sequence at this epoch. However, it does not lie on the dust obscuration relation (IRX-β) for local starburst galaxies and is instead consistent with the Small Magellanic Cloud attenuation law. This remarkable lower mass galaxy, showing signs of both low metallicity and high dust content, may challenge our picture of dust production in the early universe.